Michael Gray, the owner of ISLAND ART WORKS founded in 1975, is a native Floridian who loves creating tropical artwork in a variety of mediums. Michael was born in Rockledge, Florida and at the age of 7 was fascinated by his Aunt’s tropical landscapes…now known as “Highwaymen Paintings”. Michael’s grandparents saw his interest in art and sent him to group art classes and with a private teacher. Michael is a multi talented artist who has a natural eye for good design. 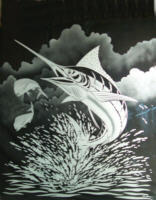 Big waves, palm trees, toucans, and dolphins capture the essence of the sea and tropical landscapes in his art work. The inspiration for Michael’s work is from nature. His memories of Merritt Island and Cocoa Beach in the 50’s are of pristine waters, abundant fish, and white sand beaches. 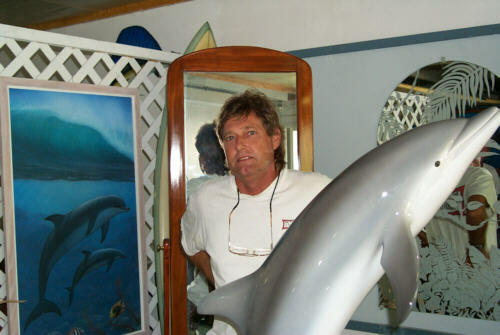 Michael started airbrushing surfboards in high school, then advanced his art to hard cast fiberglass sea creatures such as dolphin, fish, sea turtles, and manatees. The beauty of Michael’s big wave paintings takes your breath away. As a surfer Michael captures the power and intensity of the sea. His beaches are the ones of your daydreams. Later, Michael transferred his designs to etched glass doors, mirrors, and panels. His beautiful tropical scenes can be seen all over Brevard county and South Florida in the finest homes. You are invited to visit his Gallery and workshop on Merritt Island.